This is actually an updated photo, every time I make this, I try a new topping so this is the latest Triple Berry. Just add crushed raspberries to the recipe below for the glaze instead of the strawberry glaze (or raspberry pie filling will do fine!). You can buy a glaze to dip the strawberries in, and set the blackberries on the sides around the cake, such a festive looking cheesecake for any occassion, this one happened to be my Hubby's birthday! Preheat oven to 450°F. Spray bottom of 9-inch spring form pan with 2 1/2-inch-high sides with nonstick spray. Stir ground cookies, butter, and sugar and cinnamon in medium bowl until moist clumps form. Press cookie mixture firmly onto bottom of prepared pan. Wrap outside of pan with 3 layers of heavy-duty foil. Beat cream cheese and sugar in large bowl until smooth around 25 minutes till it has a smooth and creamy no lumps consistency, use an industrial size mixer on low, be patient, this needs to be silky smooth. Beat in butter, then eggs, 1 at a time, until well blended, around 8 to10 minutes. Be patient. Beat in vanilla. Pour batter over crust in pan. Place spring form pan, I spray with non stick spray first, then put in large turkey size roasting pan. Add enough hot water to come halfway up sides of spring form pan. Reduce heat to 350 and place cheesecake with water bath in the oven. ( If you have bubbles on top swirl a knife around the batter to burst before cooking. ) Bake cake uncovered until filling is puffed around edges and moves slightly in center when pan is gently shaken, about 1 hour 10 minutes. Remove pan from water; remove foil. Cool completely, in the refrigerator, remove ring only after this is completely cooled. Slide onto your favorite plate. Top with favorite toppings some suggestions below. Chill overnight or at least four hours before serving. For Strawberry...you will need one quart of fresh strawberries removing stems. Simmer till clear in pan. Add one teaspoon of vanilla. Cool pour some of the glaze on cheesecake reserving enough to dip strawberries in the glaze, place on top of cheesecake. well look at that! that is what you call a real cheesecake, yum! 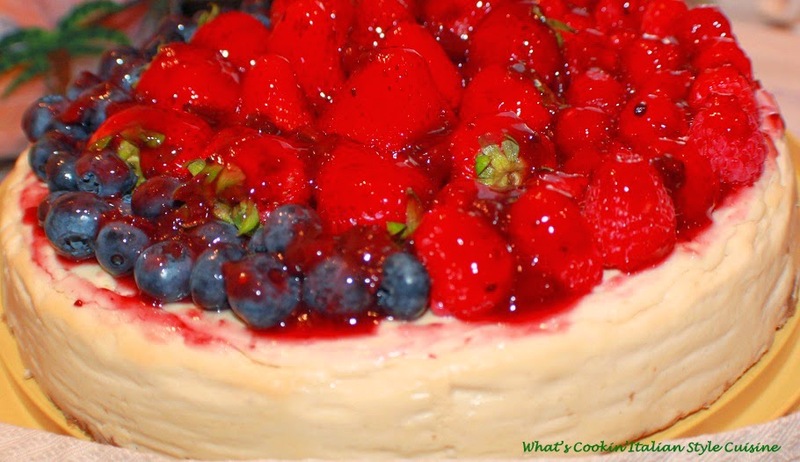 This is my kind of cheesecake...definitely going to make this one! The crust, never seen one made out of Lorna Doone cookies...that right there is yummy! Wow ! Simply irresistible ! Thank you for sharing. Cheers ! This is beautiful. I bet it tastes unbelievable! i'm curious..what's the deal with the turkey pan and water?? is this a trick i can use with all my cheesecakes?